Here is a mock up of the dial and the case and band are correct as well, but the band is flexible and could be changed. The case is set the movement would be Swiss automatic as discussed earlier. This might be a little simple for some of you but right up my ally personally. We could use different hands and we could put "928" in the lower half of the dial if that is something you guys would prefer. I love it James, although the icon above the sillouette, looks like two eyes and a nose. I love it too, except the triangle icon. If you were to just put a "dot" there, it would look like the warning light icon on the center console. ! Looks nice James. I do agree to change the triangle & dots cause it looks to me like two eyes & a nose too! The open space in the lower right seems to beg for something, but not sure just what. But good job! I'm not in the market but I agree about the 12:00 marker. Maybe just make the one along the edge a bit larger/tapered and lose the little gnome with Mickey Mouse ears.. Will it have luminescent markings? I like the MY-agnostic silhouette! Damnit, you guys just RUINED IT FOR ME! LOL! I NEVER saw that 12 o'clock icon as eyes and a nose and now that is ALL I CAN SEE! I HATE YOU ALL! We can change that easily. The watch by this manufacturer that is on my wrist as I type this has an up arrow at that location... we could probably do an oversize "! ", for those with 928's they would certainly recognize the icon... What do you think about that? Glad you guys are digging it! Sometimes less is more and sometimes it is just less...I think in this case less is more. Working on one more rendering, will post when I get it. we could probably do an oversize "! ", for those with 928's they would certainly recognize the icon... What do you think about that? Have it light up at 12:00? No? Ok, nevermind that part. Nice job, I love the simplicity of it. I would even venture to say you could eliminate the marks in between the 1, 2, 3, etc. to make it a little less busy. Yeah, need to remove the triangle or the dots. Looks Great! Can you tell us the dimensions? How big is the diamter? What is the thickness? Can we see the wristband options? Can you provide a larger, higher res pic to look at? +1 thats a good idea to help with the simplicity or lessen any clutter. & another +1 for Eric's idea of the ! lighting up at 12 O'clock, that'd be too cool. If not, perhaps make it luminescent or in florescent red/orange. Made line silhouette and 928 look more like they go together. if the watch did not have the triangle thing, would put the siihouette and 928 above the center instead of below. Squared off minute and hour hands that look more like dash gauge needles. 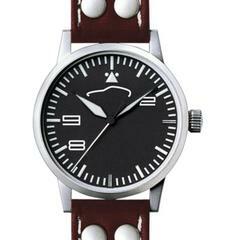 Would do the band in black with red stitching. Last edited by RKD in OKC; 06-05-2009 at 05:15 PM. I like the original concept with the 9, 2, 8 in their respective locations on the face. I also prefer the original hour and minute hand. The red second hand I like. I prefer the esoteric-ness of the first design. I prefer a large watch face with black wrist bands. I enjoy what is different. Second design reminds me of so many of marketing give away watches. Don't mean to sound negative about it, just in the quest for symmetry it becomes ordinary except for the logo. "RKD in OKC" - I am impressed with your photoshop skills. I think I like that revised look, but now I want the minute marks outta there, see what that looks like?? I like it. Would prefer the band as a timing belt look. I think the 928 only on the dial is too odd & unbalanced looking. maybe a full set of numbers with the 9, 2 & 8 bolded/bigger/contrasting color would be OK. But I actually prefer the simpler classic look of RKD's version.